My warmest congratulations to all the strong-willed graduates and completers of SY 2018-2019. 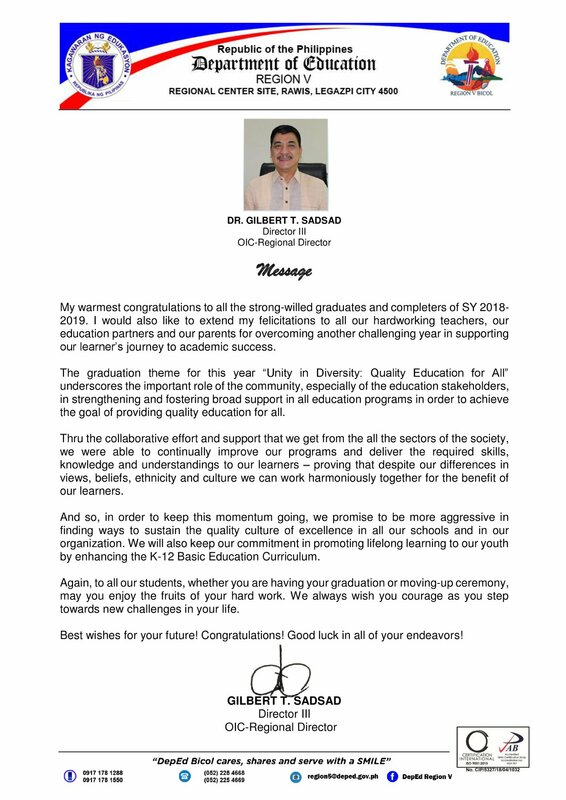 I would also like to extend my felicitations to all our hardworking teachers, our education partners and our parents for overcoming another challenging year in supporting our learner’s journey to academic success. The graduation theme for this year “Unity in Diversity: Quality Education for All” underscores the important role of the community, especially of the education stakeholders, in strengthening and fostering broad support in all education programs in order to achieve the goal of providing quality education for all. Thru the collaborative effort and support that we get from the all the sectors of the society, we were able to continually improve our programs and deliver the required skills, knowledge and understandings to our learners – proving that despite our differences in views, beliefs, ethnicity and culture we can work harmoniously together for the benefit of our learners. And so, in order to keep this momentum going, we promise to be more aggressive in finding ways to sustain the quality culture of excellence in all our schools and in our organization. We will also keep our commitment in promoting lifelong learning to our youth by enhancing the K-12 Basic Education Curriculum. Again, to all our students, whether you are having your graduation or moving-up ceremony, may you enjoy the fruits of your hard work. We always wish you courage as you step towards new challenges in your life. Best wishes for your future! Congratulations! Good luck in all of your endeavors!